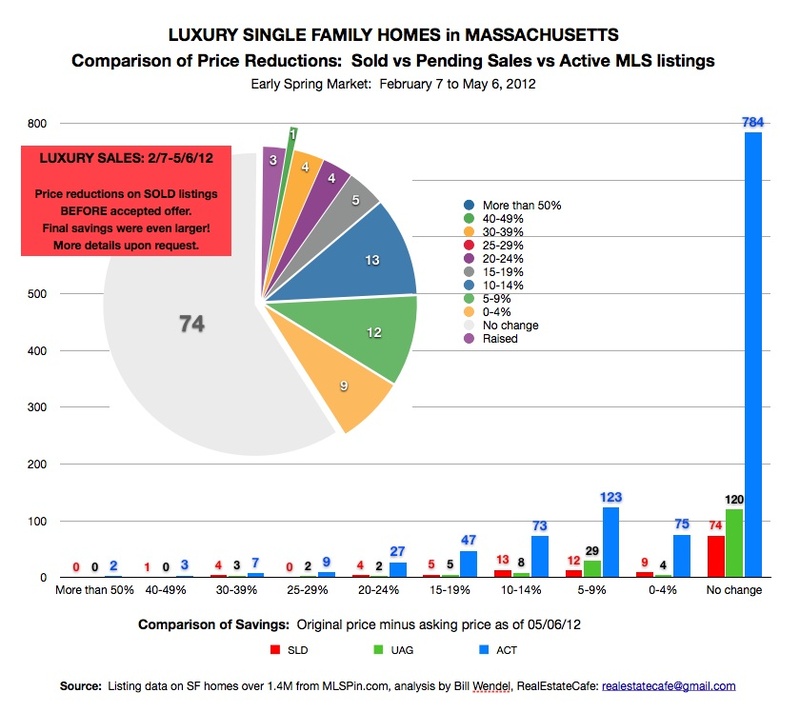 Rather than looking at a 27% rise in sales over $2 million (an estimated 15 homes across MA); why not look at the 27% of single homes sold over $1.4 million during early Spring (02/07-5/06/12) for below assessed value? Or the 10 of 20 single family homes sold over $2.85 million during the same three month period for more than one million dollars off their original asking prices? Or instead of focusing on offers accepted 3 to 10% below the last list price, cheer about sales more than 20%, 30%, or 40% below the original asking price (as shown in the graph above)? Finally, before falling for “shrinking inventory” hype, why not stop to convert current sales into annual absorption rates and compare that to active MLS listings? If there’s a three year supply of single family listings over $2M, and demand for McMansions has peaked, what’s the rush? What do readers think will happen to the price and pace of luxury home sales, and does it make sense to buy one before knowing who the next president will be? What we do know is that pending sales of luxury homes are up, particularly homes between $1.4 and 1.85M. Does that reflect increased demand or a decline in seller price expectations and substantial price reductions including some over $1 million? We’ll monitor those questions and more, and invite luxury home buyers to use our research and premium content to assess the luxury housing market from their perspective.